Let the NaNo Chaos Begin! It’s NaNoWriMo time! Despite the fact that I’m taking two writing intensive classes at school (more on this later) and applying to grad school this November, I am subjecting myself to the insanity. I’ve done NaNoWriMo for the past three years. 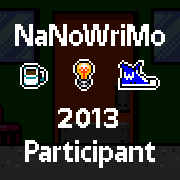 I’ve participated in Camp NaNo for the past year or so. It’s a part of my DNA now. Granted, I’ve never actually “won” any of these, but that’s okay. I participate because I have to get writing done regardless, so why not take advantage of the extra motivation? I love sitting at my computer knowing that there’s a friendly competition going on with other writers around the world. When a friend asked me last week if I was going to join in this year, I said absolutely not. How would I find the time? I should’ve known that the minute I received my first PepTalk Email that I would go running back to my computer. I am, however, changing up the rules a bit. Since I never actually win, this shouldn’t be too much of a problem. If this bothers you, then I’m sorry. I’m still doing it anyway. I’m not writing a novel. Instead, I’m going to be writing a series of short stories. I know, I know. It’s National Novel Writing Month, not National Short Story Writing Month. But just like in every other aspect of writing, the rules are meant to be broken. My reasoning here is that I don’t have any worthwhile stories to use as part of my grad school applications. Many of the short stories I have no longer “fit” me as a writer. I’ve outgrown them, learned new things, felt new feels, and therefore need to start from scratch again. But the deadlines are looming. This is where that good ol’ NaNo motivation comes in. At 1,667 words a day, I’ll have my 25 page writing sample in no time at all. I promise I won’t stop there, even though it’s safe to say that I’ll probably only get to 13,000 words before I’m ready to rip my hair out. Now it’s late, and even though I only hit 1,217 words, I’m going to bed. Otherwise I will be very cranky at knitting group tomorrow morning.